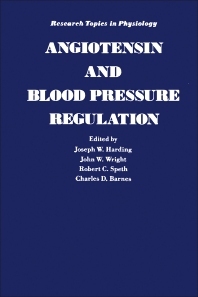 Angiotensin and Blood Pressure Regulation examines the role of angiotensin in blood pressure regulation, with emphasis on its ability to influence the inotropic state directly via activation of myocardial receptors and indirectly by potentiating the release of catecholamines from sympathetic nerve terminals. The book also explains how angiotensin acts directly to regulate thirst and sodium appetite, and via antidiuretic hormone to control water reabsorption in the kidney. This book is comprised of eight chapters and begins with a review of the neuronal actions of angiotensin, primarily those in the brain, as well as the location and function of brain angiotensin II receptors. The effects of angiotensin on elements of the vascular wall and myocardium are also discussed, along with its function in hypovolemia, reproduction, and neurotransmission. Subsequent chapters explore some basic and functional considerations of the renin-angiotensin system in the brain; the biochemical processing that is required for angiotensin activation and inactivation; how angiotensin affects peripheral resistance; and the potency of angiotensin III as a pressor and dipsogenic agent in normotensive and hypertensive animal models. This monograph will be a useful resource for pharmacologists and physiologists.